Sweet chili sauce and lime juice turn this Sweet Chili and Lime Chicken into the easiest and tastiest dinner! Post may contain affiliate links. Have you discovered sweet chili sauce? It’s a condiment that I can’t live without. My favorite is Mae Ploy Sweet Chili Sauce , which I order regularly from Amazon. I noticed that they also have a Trader Joe’s version – has anyone tried it? Anyway, it is the perfect condiment, nice heat with a little sweet. It is what pulls together this completely simple dish. Click here to pin this Sweet Chili and Lime Chicken now! First you mix it with some lime juice and olive oil and it makes a glaze for the chicken. Then later it accompanies the meal, a drizzle of it over the whole bowl, just brings everything together! This was so delicious and so simple. It’s a great way to use up some late season cucumbers. I found this recipe in Donna Hay’s Magazine #55, Feb/March 2011. Yep, it’s old, but like most good recipes, it is timeless. It wasn’t even actually a recipe, it was one of those quick paragraph recipes, where they mostly tell you what to do, but don’t really give measurements. It’s so simple it doesn’t even need measurements, but I’ll try and give you a ball park in the recipe. Basically you brush chicken with the glaze and grill it. You shred some cucumbers, red chile peppers and green onions and cook some rice. That’s it. Put it all together and top with a generous drizzle of the sweet chili sauce and you are good to go! A sweet chili sauce makes this Sweet Chili and Lime Chicken so easy and delicious! Combine 1/4 cup chili sauce, lime juice and olive oil. Brush on the chicken breasts. Cook using a grill pan or grill over medium-high heat for about 4 minutes each side. Combine cucumber, chile pepper, and green onion. 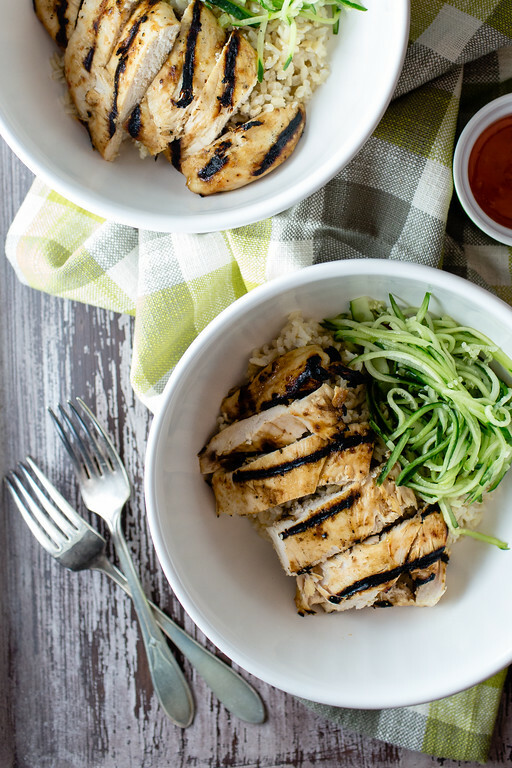 Divide the rice among four bowls, top with the chicken and the cucumber salad and drizzle with more sweet chili sauce. Thanks so much for sharing this awesome bowl of goodness with us, I can’t wait to try it! Have a great week and come back to see us at Full Plate Thursday real soon! This is my kind of dinner! I love sweet chili sauce! How wonderfully simple, I love sweet chili sauce with chicken and the zing from the lime sounds superb! Oooh chili and lime, what a perfect combo! This needs to be made ASAP! It is the perfect combo!! You’ll have to let me know if you like it! yum! love a chili lime flavor combo. It sounds like a lovely dish to me, Pam! I have a feeling it would be a hit dinner in our house! This looks like my kind of food! I love simply prepared chicken and this sounds so unique! Thanks for sharing your recipe! Must get some sweet chili sauce! And I’m loving the look of those cucumbers! This would make a great, simple and healthy lunch. Love sweet chili sauce! Great recipe for a weeknight dinner! Easy is good; tasty is good. Together, it’s just great! I can’t believe how fast this is. That’s not an old recipe. She trots that out under a different name every couple of years or so. Just like the mustard pork chops. It is a nice recipe though.enjoy! I love sweet chili sauce! This sounds like the perfect, and very tasty, quick weeknight dinner. A little chili and lime! Yum! Add in some sweet?!? yes please! A little heat and a little citrus to cut the heat and dinner is served. Love the simplicity of this recipe. Perfect year round. Looks delicious and your pictures are beautiful! Pinned! This chicken looks so succulent and delicious!